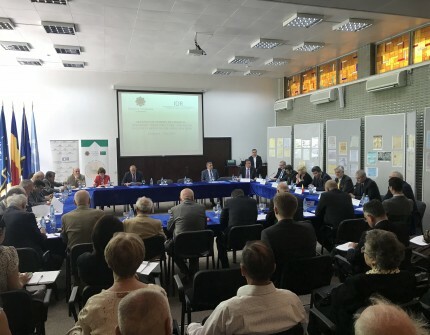 On May 7, 2018, the Embassy of Turkmenistan in Romania together with the Diplomatic Institute under the Ministry of Foreign Affairs of Romania organized a round table on "Creating a modern multimodal transport infrastructure - the key to success in the revival of the Great Silk Road". The State Secretary of the Ministry of Transport of Romania, Maria Magdalena Grigore, took part as the main guest of the event. Representatives of the Ministry of Foreign Affairs, Parliament, the Ministry of Business Environment, Trade and Entrepreneurship, the Chamber of Commerce and Industry, the National Union of Road Transport of Romania, the Silk Road Association and other ministries and departments of Romania, representatives of the diplomatic corps accredited in Romania, local public and media, as well as Turkmen students studying in the universities of Bucharest attended the round table. Director of the Diplomatic Institute of Romania Dan Petre, Ambassador Sh. Djumaev, State Secretary of the Ministry of Transport of Romania Maria Magdalena Grigore, Ambassador of Azerbaijan to Romania Farid Abdinbaev, Ambassador of Georgia in Romania Nikoloz Nikolozishvili, Director of Eastern Europe and Central Asia Department of the Ministry of Foreign Affairs of Romania Cornel Ionescu, Vice-Rector of the Institute of international relations of the Ministry of Foreign Affairs of Turkmenistan J. Gurbangeldiev, Head of the Department of International Relations of the Chamber of Commerce and Industry Virgil Goaga, Secretary General of the National Union road transport of Romania Radu Dinescu and the President of the Association of Silk Road of Romania Apti Metin made presentations at the round table. During the round table, the participants were acquainted with the international initiatives of the President of Turkmenistan in the transport sector, as well as with major infrastructure projects currently being implemented in the territory of our country. All the speakers highly appreciated the international initiatives of the President of Turkmenistan in the transport sector, noting that they are aimed at establishing and the development of mutually beneficial relations between countries and regions. The speakers also expressed readiness for comprehensive cooperation with Turkmenistan in the transport sphere. At the end of all speeches, the participants were shown a video about the new International Seaport in Turkmenbashi and its role in the revival of the Great Silk Road. Also, at the end of the event, the Embassy organized a reception in the reception hall of the Institute, during which the guests were offered dishes of Turkmen national cuisine.